Valle Gaia is a luxury camping site set in a corner of paradise alongside the enchanting Etruskan Riviera. The site is surrounded by olive groves and pine forests, while the sea is just six miles away as well as the picturesque Tuscan islands of Capraia, Gorgona and Elba. Lovers of luxury will find everything they need to enjoy a decadent and unforgettable camping holiday in Italy, while the location of Valle Gaia provides quick and easy access to a number of Italy’s most popular cities such as Florence, Siena and Pisa. What makes Valle Gaia So Special? Taking care of the laundry at Valle Gaia is simple, as the site comes complete with a washing machine for visitors to make use of. The main washing area boasts a total of twelve individual cubicles which can also be accessed by those in a wheelchair, while the area also features a baby changing area. Anyone choosing to rent a mobile home at Valle Gaia will be able to spend their time taking part in a wide range of different sports. 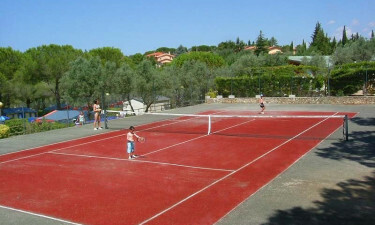 There are two large tennis courts for guests to make use off and this is the perfect place to let off a little steam. Other sports that can be enjoyed at Valle Gaia include volleyball, basketball and football, while visitors who want to explore the area surround this LUX-camp at their own pace can hire bicycles and follow the trails that wind their way through the countryside. A special gaming hall is available for adults who want to unwind for a few hours while the kids have fun playing in the large children’s playground. 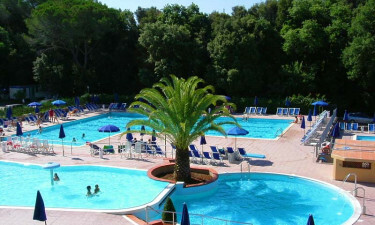 Naturally, there are also plenty of places where the whole family can have fun together such as the large outdoor swimming pool, which is open to guests all year round and the Italian style bowling alley. 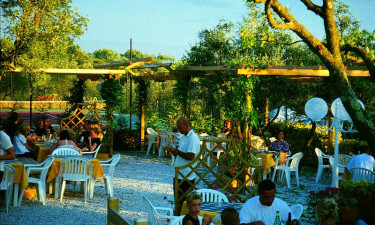 The onsite restaurant means that people who stay at Valle Gaia will never have to go far in search of refreshment. The restaurant specialises in freshly prepared Italian dishes and this is a great place to enjoy traditional Tuscan cooking and hospitality. Valle Gaia also boasts a central campfire, and this is a popular place for visitors to gather in the evening to make friends and soak up the enchanting atmosphere. Families can also have a lot of fun cooking their own meals together at Valle Gaia and charcoal grilling is permitted here. The onsite supermarket provides visitors with everything they need to create meals for the whole family to enjoy and those who want to save time will also find several canned and packed meals as well as freshly baked bread, while snacks are also sold at a concession stand in the grounds of Valle Gaia.